The best way to get to know a country is to move there, marry a local and learn the language. We didn’t have time for any of that so we did the next best thing and took a road trip to see some of the country. We flew into the capital Yerevan and then headed south to experience Armenia. 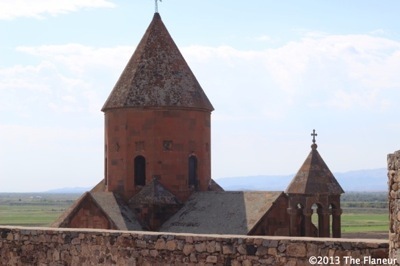 We left Yerevan at 9.30am and headed south towards Khor Virap monastery. The road here is super-wide, as it was used as a runway to bring in airborne supplies during the 1990s war with Azerbaijan. Driving along it you still get glimpses of border guard posts where soldiers patrol the closed border with Turkey. Along the route farmers sell their produce from small stalls or the back of trucks – it was watermelon season when we drove through. Just pull over to buy some straight-from-the-field fresh fruit and vegetables. The road top-surface has been removed and is currently being relaid, so when you arrive it should be a sleek asphalt motorway. Just past Taperakan turn right towards the Khor Virap sanctuary. The road leads to the monastery which has fantastic views of Mount Ararat. Khor Virap means Big Pit, and refers not to a coal mine, but to the dungeon around which the monastery is built. 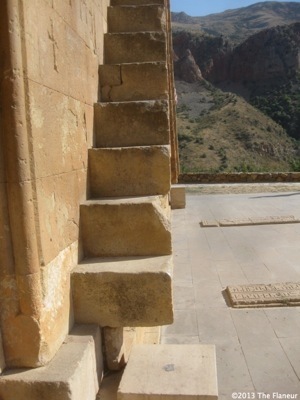 This location has great significance in the history of Armenia. St Gregory the Illuminator is the man that convinced King Trdat III to convert to Christianity in 301AD and make Armenia the first Christian state. Which sounds great, but to get to that position Gregory had some troubles to overcome. Before his conversion the King had punished Gregory for not worshipping an idol, by throwing him in the dungeon at Khor Virap. So I have been in the same dungeon as St Gregory. I didn’t really have the same experience though, as I was there for about a minute and he was kept there for thirteen years. THIRTEEN YEARS! That’s a long time to be anywhere, let alone a damp dungeon without a view. It seems that St Gregory was the forgiving type, as after thirteen years the same king hauled him out and asked for healing for a disease. Gregory prayed, Trdat was healed, with the resulting conversion of the king and country to Christianity. You do wonder what the king said after he was healed. ‘Sorry about the thirteen years in a dungeon, old chap,’ doesn’t seem enough. Anyway, three cheers for St. Gregory. 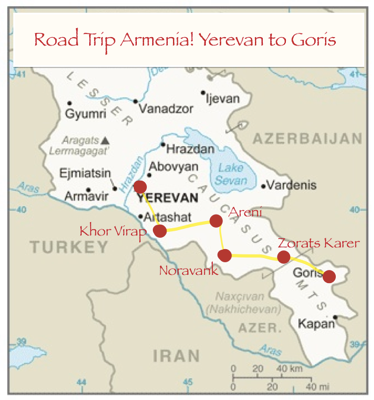 Next we headed along the M2 to Areni in the Vayots Dzor region, where the Armenian wine industry is based. Wine-making has quite a heritage here – wine has been made in Areni for 6000 years. If they have a bottle from that first 4000BC harvest we didn’t get to see it, but we did taste several of their more recent vintages. They export their wines to France, which gives an indication of how they are regarded. 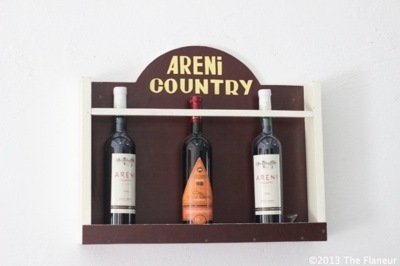 As well as dry, spicy wines from the local Areni grape, they also produce fruit wines, such as apricot and pomegranate, and various flavours of schnapps. You don’t need to speak Armenian to understand that you are being advised to knock back the 60% schnapps in one go. If the tasting servings weren’t so big it might be possible, but it defeated me. After our aperitif in Areni we turned right off the M2 and headed up the Norovank Gorge. 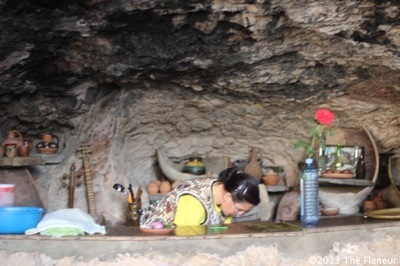 If you are in this part of Armenia and like an unusual experience then you shouldn’t miss having lunch in the Cave Cafe. The name Cave Cafe,has probably given away what is unusual about it, but if it hasn’t then it is in a cave. It’s very easy to miss as there are no relevant signposts. It is on the right as you drive towards the monastery, and the nearest sign says something about birds. The gorge is fifty metres across, with vertical sides. Crossing a footbridge over an excitable brook, we sat in a private area marked off with hanging carpets. I thought I must have misheard. I added some to the lavash wrap I was making. I think it’s an acquired taste. Unlike the fried potato slices and meaty local Karmra Khayt fish which are tasty from the first bite. 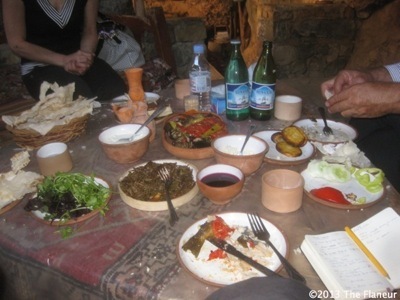 After lunch in the cave we carried on up the road to Noravank, one of Armenia’s best known monasteries. Noravank means New Church, although it was built in the 13th century, making it even older than Paris’s 16th century Pont Neuf. 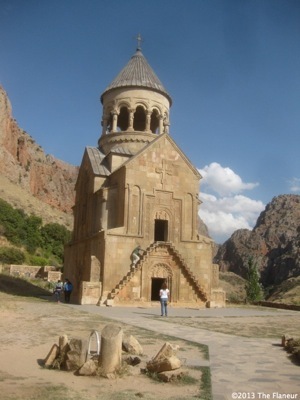 The monastery complex contains the foundations of the original church of St John the Baptist, but it is the Noravank church that looks most impressive. Reconstructed in the 1990s, it has three levels – a burial chamber for the Orbelian family, a prayer house and a bell tower. 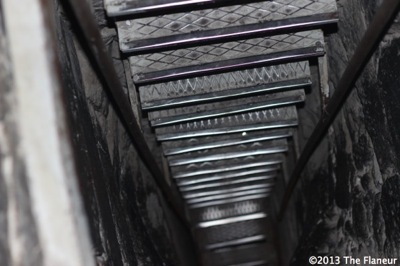 The very narrow set of stairs up to the prayer house are a conundrum. They are dangerously narrow, and it is hard to see a well-fed monk making his way up and down them too often before falling and breaking something, probably his neck. 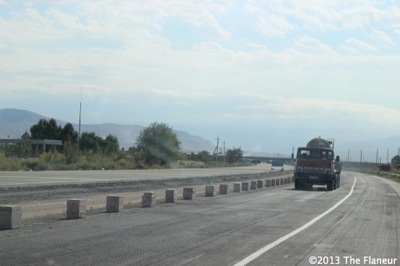 Back on the Yerevan-Meghri motorway we headed over the Zangezur mountains, stopping for fruit at an unashamedly Soviet monument to nothing in particular. Up here the temperature was cooler, with that delicious mountain air that always makes me think I should move to the top of a hill. 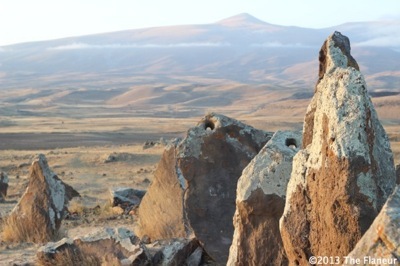 It wasn’t much further to Zorats Karer, an Armenian version of Stonehenge that is more than 3000 years older than the Egyptian pyramids. The turning off the motorway leads to a poor quality road – you will probably think this can’t be the right way. Persevere and you will find the ancient monument, though you will have to walk the last part as the road is so rutted. An alternative local name is Karahundj. As Kara means stone, the link with Stonehenge becomes obvious, though the visual similarities are slight. The basic fundamentals are the same, although these carefully positioned standing stones have holes cut into them, which had been the subject of much scholarly debate. A giant observatory or clock seems to be the consensus. Even here, a long way from anywhere, there is a souvenir shop. Do visit and even if you don’t buy anything have a look at the shop-keeper’s personal collection of foreign coins. Unfortunately I had taken all my English coins out of my pocket that morning so I couldn’t add to his treasure trove, but if you have a coin he hasn’t got then add it to the collection. Dusk was with us as we carried on to Goris, overtaken by an Iranian coach tilting dangerously from side to side. It is a small town set in a gorge and the road descends to it just asthough you are heading to a seaside resort. We arrived in the dark and I had the strong impression that the sea was at the bottom of the gorge. It isn’t though, what with Armenia being land-locked and everything. We stayed at the Mirhav hotel, which has free wifi and a library of books about Armenia. Parking the blue Mercedes van that had been our trusty chariot, we dined at the hotel on some more authentic Armenian food. An aubergine salad, more oily than others I had experienced in Armenia but with a similar, though not so potent smokiness. 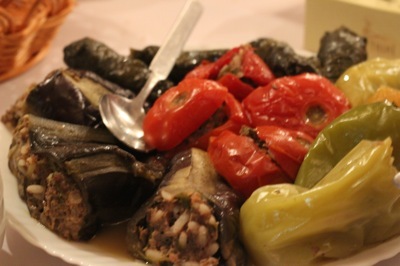 Followed by the very traditional Armenian dish of Dolma. Chunky mince is mixed with large grained rice and then used to stuff tomatoes and peppers, or is wrapped in grape leaves and slices of aubergine. For pudding we had pastry cigarettes, which are sweet pastry twists filled with walnut paste. Another Armenian dessert that you pick up telling yourself I’ll just have one bite, to see what it’s like, yet before you know it you have eaten the whole thing and are looking for another. Khor Virap is located in Ararat Valley. It hasn’t decorative elements but people spend half day for coming from Yerevan.